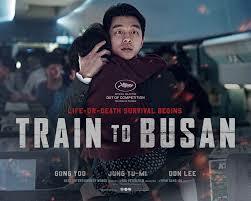 WE HAD no intention of watching “Train to Busan” because we’re thinking: what else can it add to the so many zombie movies and TV shows we’ve seen before? But our kids wanted to see it, so off we went to watch it. The first 30 minutes, we were so cynical about it, thinking it’s too derivative and we still prefer “28 Days Later”, “Zombieland”, Zombie Apocalypse”, the original “Night of the Living Dead”, and even “World War Z”. But after about 45 minutes, when the major characters are already trapped inside a train, we get seriously hooked. Yes, it has something else to offer. The story starts quietly with a truck stopping on a toll road and has to be sanitized by masked health workers before the vehicle is allowed to enter. The driver is busy with his cellphone and hits a deer on the road. He thinks the deer, lying in a pool of blood, is dead, so he drives away, but the deer suddenly springs up, with glassy eyes to indicate that it is an infected zombie deer. We then meet a busy workaholic single dad, Seok Wu (played by Gong Yoo). He hardly has anytime to spend with his daughter Su-an (Kim Su-an), who’s celebrating her birthday and desperately wants to be reunited with her mother who lives in Busan. He failed to show up at Su-an’s school recital so he gives in to her request to take her to Busan and they take the high speed train going there. The last passenger to hop into the train is a young woman who’s having spasms and seizures with scary crisscrossing veins on her legs. She is not noticed by anyone as people were more disturbed by a shabby homeless ‘taong graza’ who’s found hiding in the train’s toilet. On the train’s TV sets, there are alarming reports about riots going on in the city but hardly anyone is concerned. We kept asking ourselves why they seem to just be waiting to be eaten. Haven’t they watched zombies movies before? But once the infected woman bites her first victim, a train attendant, the pacing quickens as the other passengers also get bitten and become zombies themselves. The father and daughter story is very involving as the seemingly negligent dad becomes thoroughly concerned in saving his daughter once the zombie outbreak happens and all hell breaks loose. What happens to them in the film’s climax is really heartbreaking. The acting is generally outstanding, especially the little girl who’ll surely tug at your heartstrings. Aside from her and her dad, the other characters we meet inside the train are a pregnant woman and her seemingly boorish husband, a young baseball player and his girlfriend, two elderly women, the taong graza who proves to be selfless in protecting others, the train’s driver and an annoying businessman who’s concerned only with himself and becomes the main contravida who causes the death of other passengers just to save his own skin. The zombies here are not as scary in appearance as in “Walking Dead” where they are heavily made up. Here, they look more human, only with glossy eyes and bulging veins on their faces. They’re kind of dumb as they don’t even know how to open doors. They also cannot see in the dark and the hero uses this to outwit them in several suspenseful moments in the movie. But they don’t move slowly. As a matter of fact, they run with great speed and one of the indelible images in the movie shows the zombies running hurriedly after a moving train and with them piling up on top of each other. 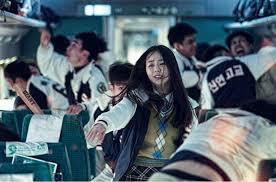 Aside from the zombie story, the film’s writer-director Yeon Sang-ho, manages to make a comment about human nature and moral polarization, with lots of people being so selfish and thinking only of their own welfare, which is in direct contrast to the little girl, Su-an, who has an inherently kind and clean heart. But in the end, can you really blame those people who prioritize their own safety when thrown into a life or death predicament like this? The director should also be commended for cooking up some thrilling sequences considering the limited space he has to work on, using imaginative and agile camerawork even inside the trains cramped toilets. The crisp editing of various action sequences also raises the suspense bar. The train crash sequence while the driver is trying to find another train is also well executed. And lastly, we can’t help but marvel and drool at the handsome trains of Korea looking so sleek and first rate. As you watch, you will no doubt feel very sad and envious when you consider the deplorable state of our own train services like the MRT and the LRT.